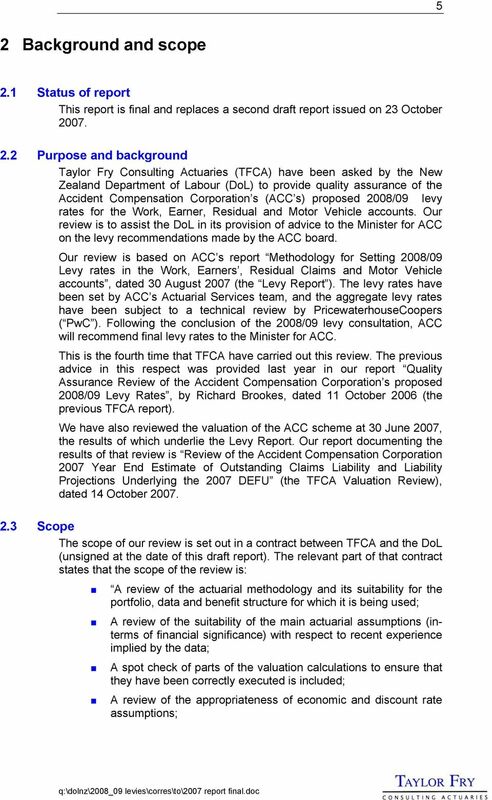 Download "Department of Labour of the Government of New Zealand"
3 2 1 Executive Summary 1.1 Scope This report documents Taylor Fry Consulting Actuaries (TFCA) review of the Accident Compensation Corporation s (ACC s) proposed 2008/09 levy rates for the Work, Earner, Residual and Motor Vehicle accounts. Our review is to assist the Department of Labour in its provision of advice to the Minister for ACC on the levy recommendations made by the ACC board. 1.2 General Statement Our conclusions are as follows: We have reviewed the methods used for setting the levy rates for suitability in the circumstances against current actuarial practice and conclude that they are, for the most part, suitable; We have reviewed the assumptions for consistency with available experience and trends and conclude that most of them are consistent or, if not, that there are valid reasons for the assumptions used; Exceptions to these two statements are summarised in sections 1.3 and 1.4. 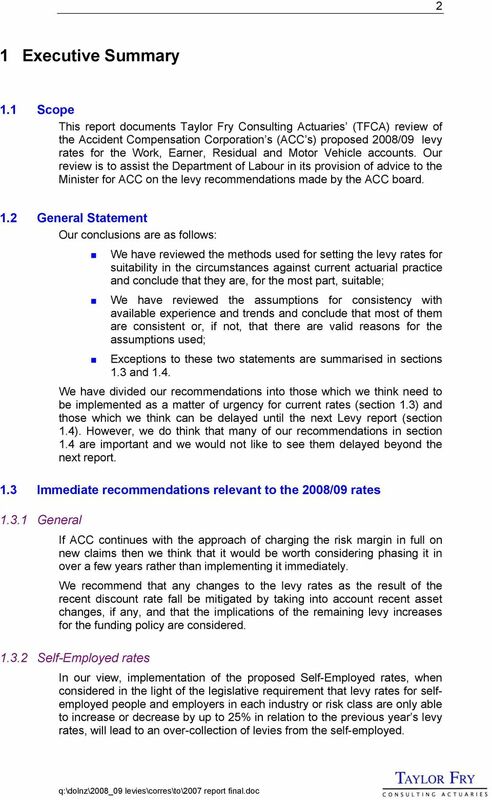 We have divided our recommendations into those which we think need to be implemented as a matter of urgency for current rates (section 1.3) and those which we think can be delayed until the next Levy report (section 1.4). However, we do think that many of our recommendations in section 1.4 are important and we would not like to see them delayed beyond the next report. 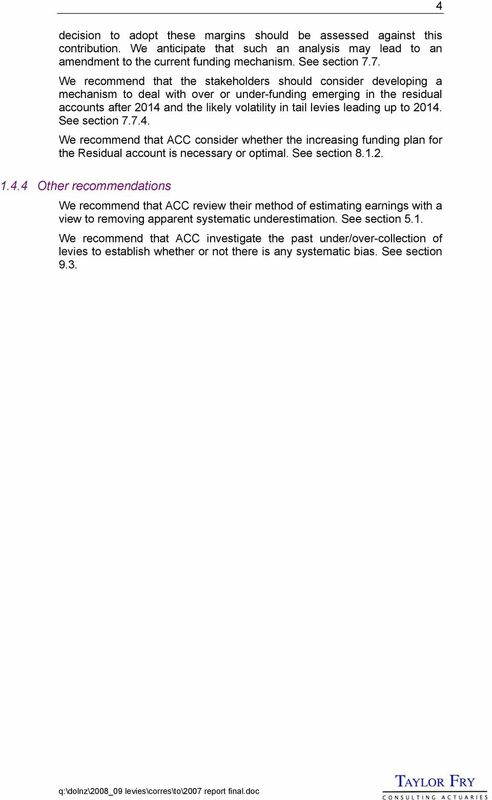 1.3 Immediate recommendations relevant to the 2008/09 rates General If ACC continues with the approach of charging the risk margin in full on new claims then we think that it would be worth considering phasing it in over a few years rather than implementing it immediately. We recommend that any changes to the levy rates as the result of the recent discount rate fall be mitigated by taking into account recent asset changes, if any, and that the implications of the remaining levy increases for the funding policy are considered Self-Employed rates In our view, implementation of the proposed Self-Employed rates, when considered in the light of the legislative requirement that levy rates for selfemployed people and employers in each industry or risk class are only able to increase or decrease by up to 25% in relation to the previous year s levy rates, will lead to an over-collection of levies from the self-employed. 7 6 Any recommendations of improvement to any area of the process or information are provided; and To exclude any independent evaluation of the data; we do not wish to purchase a full independent calculation, or an exhaustive check of all the calculations being reviewed. The contract goes on to specify that the review will cover the levies proposed by ACC for the Residual Claims Account, Work Account (including the discounts and stop-loss/high-cost-claim-cover levies for the partnership programme employers also including Coverplus and Coverplus Extra), Earners Account, and Motor Vehicle Account, including: The sustainability of the proposed levies; The application of any margins included in the calculation of the levy rates taking into account the reserving position of each Account and the Boards approved reserving policy; and The relativities between the levy risk groups in the Work Account. 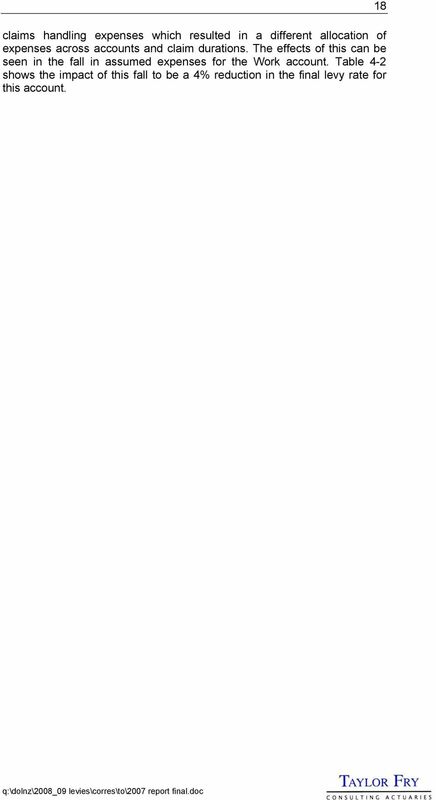 2.4 Addressee of report This report was commissioned by Andrew Marshall of the DoL and is addressed to the DoL. 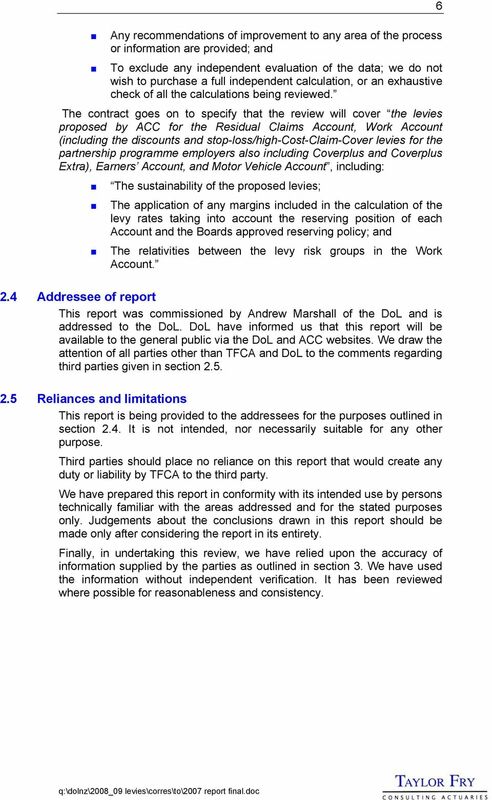 DoL have informed us that this report will be available to the general public via the DoL and ACC websites. 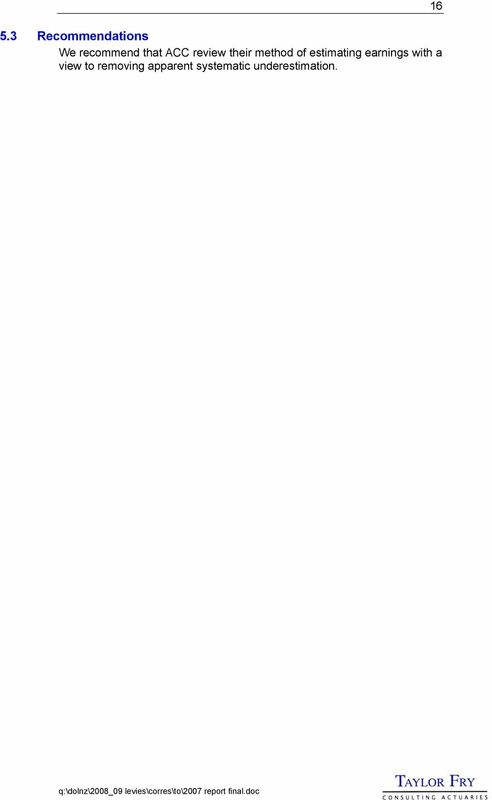 We draw the attention of all parties other than TFCA and DoL to the comments regarding third parties given in section Reliances and limitations This report is being provided to the addressees for the purposes outlined in section 2.4. It is not intended, nor necessarily suitable for any other purpose. Third parties should place no reliance on this report that would create any duty or liability by TFCA to the third party. We have prepared this report in conformity with its intended use by persons technically familiar with the areas addressed and for the stated purposes only. Judgements about the conclusions drawn in this report should be made only after considering the report in its entirety. Finally, in undertaking this review, we have relied upon the accuracy of information supplied by the parties as outlined in section 3. We have used the information without independent verification. It has been reviewed where possible for reasonableness and consistency. 8 7 3 Information supplied This section describes the data supplied to us from various sources: ACC s draft Levy Report dated 30 August 2007 and appendices, supplied by Gavin Pearce of ACC; Various spreadsheets supporting the Levy Report, also supplied by Sandra Chapman of ACC; PwC s letter detailing the results of their technical review of overall levy rates, supplied by David Gifford of PwC; PwC s letter detailing the new method for setting risk relativities in the work account, supplied by Gavin Pearce of ACC; ACC s bad debt provision report as at 30/4/2007 provided by Sandra Chapman of ACC; A paper discussing the removal of the CPX age related discount along with supporting analysis provided by Sandra Chapman of ACC; and A copy of the final Amendment Bill relating to the Injury Prevention, Rehabilitation, and Compensation Act provided by Andrew Marshall of DoL. We have received the full cooperation of all the parties named in this section and received all the information that we requested. 10 9 There have been substantial increases to the estimates of liable earnings in the Work and Earners accounts; There has been a significant decrease in the estimated entitlement claim frequency for the Work account and a significant increase for the Earner s account. 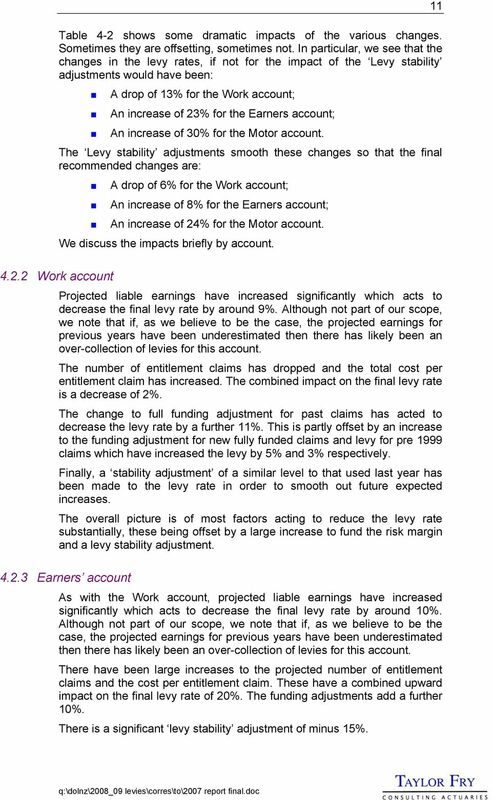 We discuss this in section 5; Total risk costs per entitlement claim have increased modestly for the Work and Earners accounts and rather more so for the Motor account. We discuss this in section 6.1; The expense allowance has decreased for the Work Account. We discuss this in section 6.3; There has been a large increase in the Funding adjustments for new claims in all accounts. 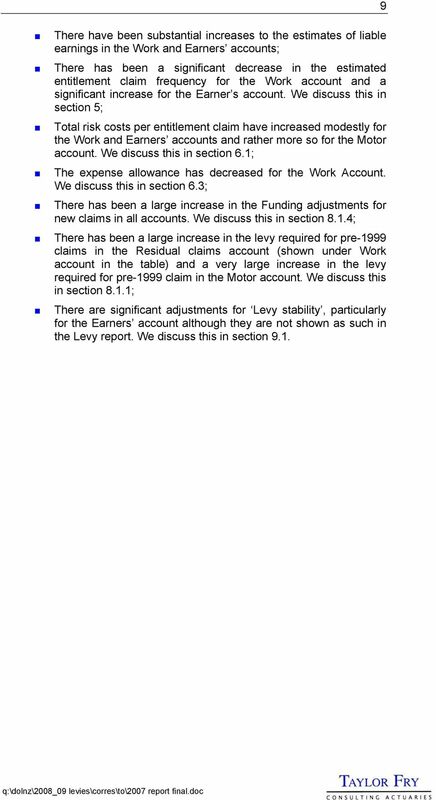 We discuss this in section 8.1.4; There has been a large increase in the levy required for pre-1999 claims in the Residual claims account (shown under Work account in the table) and a very large increase in the levy required for pre-1999 claim in the Motor account. 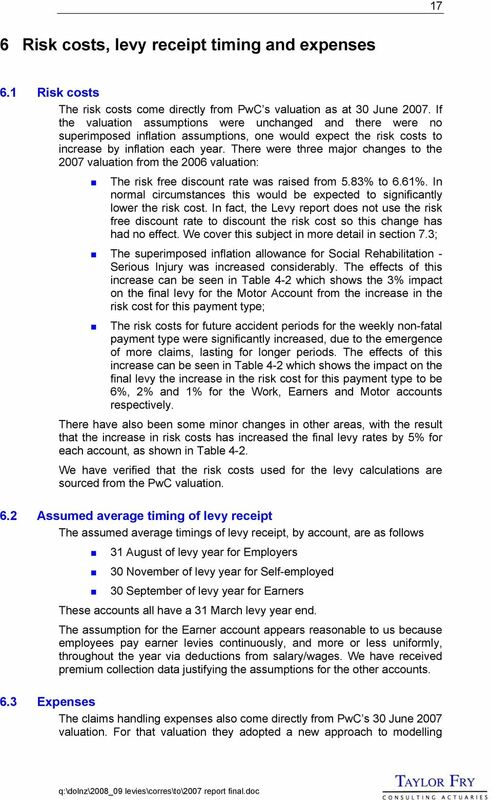 We discuss this in section 8.1.1; There are significant adjustments for Levy stability, particularly for the Earners account although they are not shown as such in the Levy report. We discuss this in section 9.1. 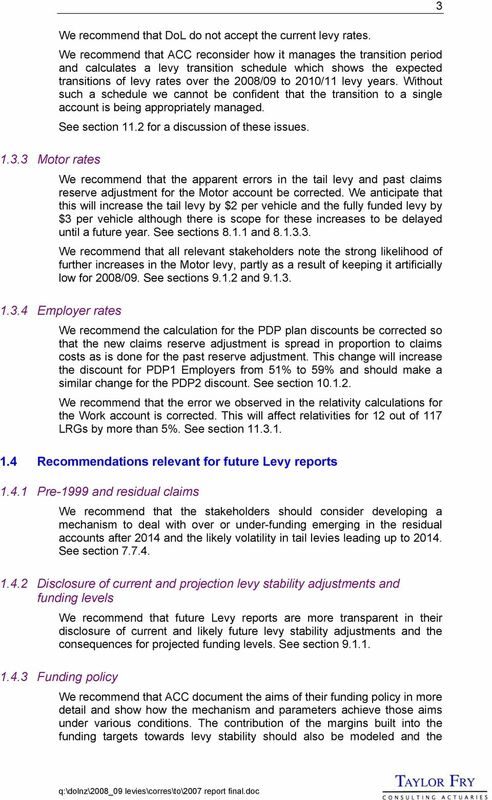 13 The overall picture is of increases of 30% which are offset by an increase in the estimate of liable earnings of 10% and the levy stability adjustment of minus 15% Motor account There has been a modest in increase in the number of vehicles, the impact of which is almost exactly offset by an increase in the number of entitlement claims. 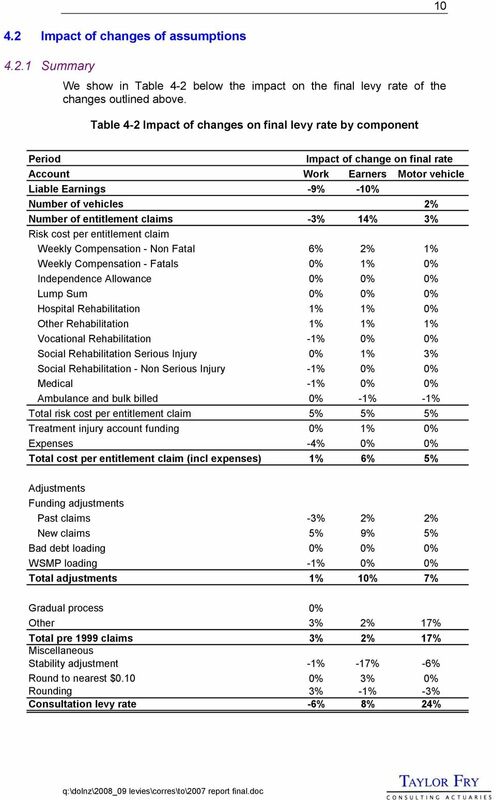 The cost per entitlement claim has increased the levy rate by 5% and the funding adjustments on the fully funded claims have added a further 7%. The major increase is due to an increase in the levy for the pre 1999 claims which adds 17% to the levy rate. This has been partially offset by a levy stability adjustment which reduces the levy by 6%. 16 entitlement claims is increased but the total risk cost remains constant then the presented risk cost per entitlement claim will fall. 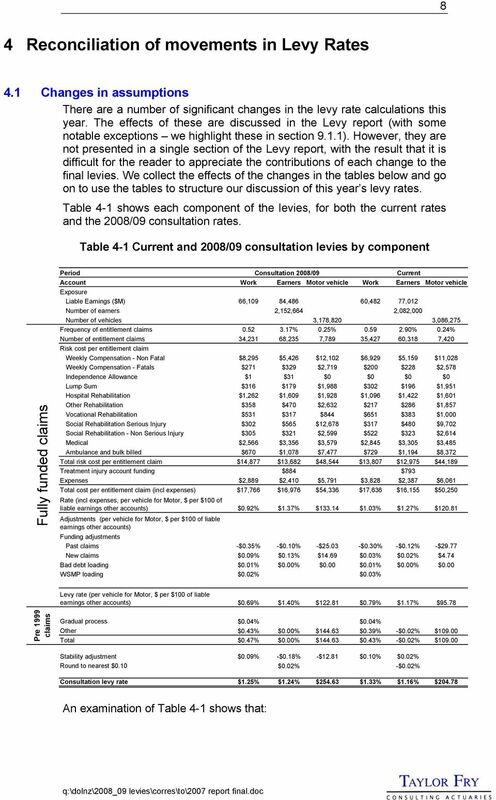 For this report, the projected numbers of entitlement claims for the Work and Earners accounts have changed significantly from the previous Levy report, as shown by Table 5-2 below: Table 5-2 Increase in projected number of entitlement claims since previous Levy report 15 Entitlement claims Account Consultation 2008/09 Current Change Work 34,231 35,427-3% Earners 68,235 60,318 13% Motor 7,789 7,420 5% In normal circumstances, one would expect a modest increase in the number of entitlement claims, in line with the growth of the underlying population. For instance, the number of licensed vehicles has increased by 3% over the last year which is in line with the increase in the number of entitlement claims in the Motor account. The fall in the number of claims for the Work account seems a little unusual in the light of the increase in the projected number of workers but we have not investigated it further. 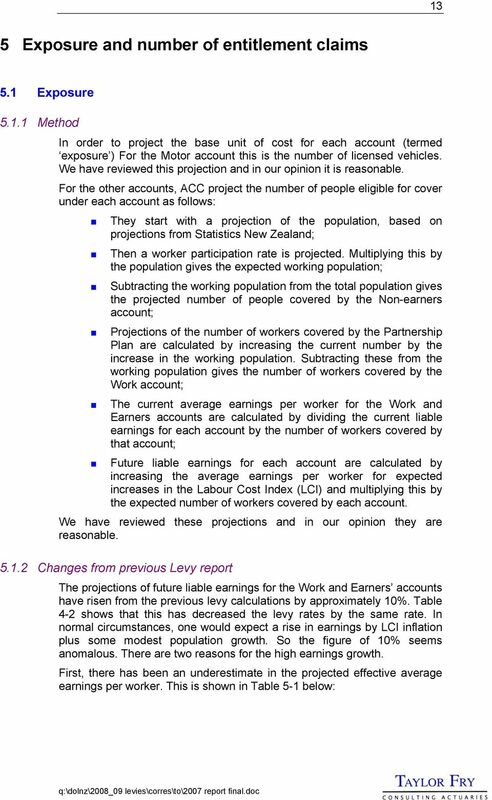 The increase for the Earners account is due to a decision for this Levy report to recognise an increasing trend in past numbers. We show the projections for this report and the previous report in Figure 5-2 below: Figure 5-2 Projected entitlement claims in the Earners account Projected number of entitlement claims at successive calcuation dates Number of claims 20,000 15,000 10,000 5, Sep-01 Sep-02 Sep-03 Sep-04 Sep-05 Sep-06 Sep-07 Sep-08 Accident quarter We are comfortable with the new assumption and believe that it is consistent with the increase in risk cost adopted by PwC in their valuation as at 30 June 2007 as we discuss in the next section of this report. 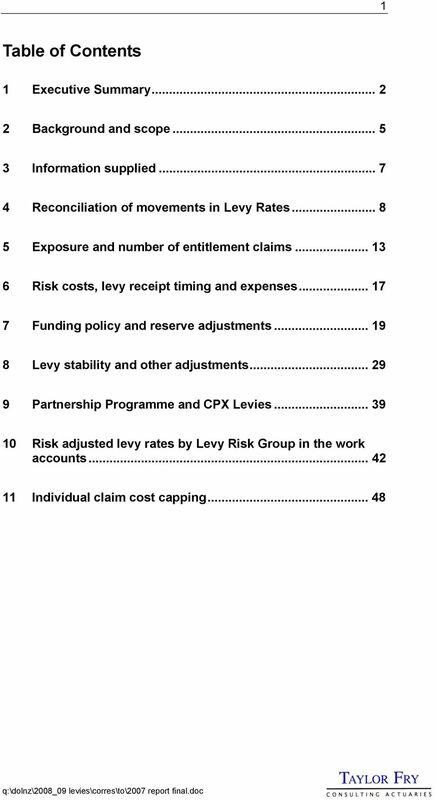 20 19 7 Funding policy and mechanism 7.1 Funding principles The Levy Report states that ACC s funding policy has two main principles: Financial sustainability in the long term; and Levy setting, having regard to Levy stability Forecast uncertainty The provision of incentives for injury prevention Equity considerations. This is a change from previous reports in which the principles were stated to be: To manage levy stability over time; To ensure that the ACC account has enough funds. We are not sure whether or not the reported change of principles has had or will have any eventual effect on the actual funding mechanism. This year ACC has adopted the same funding mechanism as in previous years. This mechanism is dependent on various funding parameters. Although the mechanism has been the same for a number of years, the parameters have changed markedly over time and they have changed again this year. We discuss these issues below. 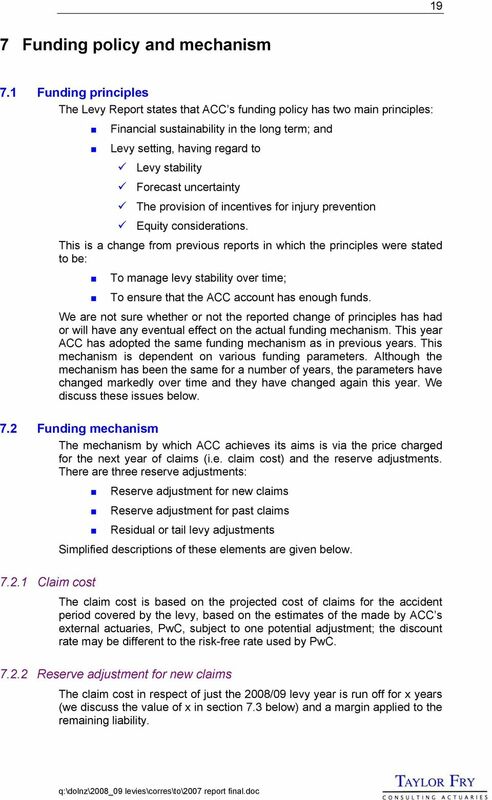 7.2 Funding mechanism The mechanism by which ACC achieves its aims is via the price charged for the next year of claims (i.e. claim cost) and the reserve adjustments. There are three reserve adjustments: Claim cost Reserve adjustment for new claims Reserve adjustment for past claims Residual or tail levy adjustments Simplified descriptions of these elements are given below. 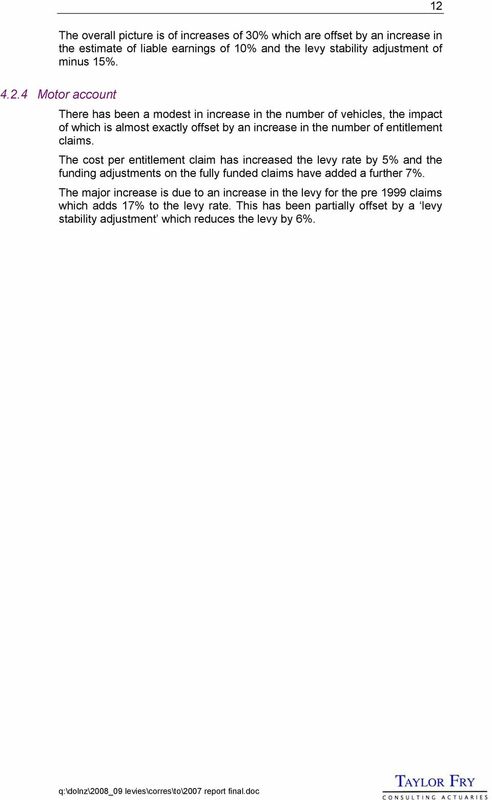 The claim cost is based on the projected cost of claims for the accident period covered by the levy, based on the estimates of the made by ACC s external actuaries, PwC, subject to one potential adjustment; the discount rate may be different to the risk-free rate used by PwC Reserve adjustment for new claims The claim cost in respect of just the 2008/09 levy year is run off for x years (we discuss the value of x in section 7.3 below) and a margin applied to the remaining liability. 22 21 The expected future costs of existing claims, excluding any margin, discounted at the risk free rate; The liability as disclosed on the ACC balance sheet; and The expected future costs of existing claims, discounted at the assumed investment return on assets in the fund. 7.4 Changes since the previous Levy report The funding parameters have been changed again for this year: The discount rate used for past claims has been switched from the expected earning rate on the assets to the risk free rate (although the rate used for new claims remains at the expected earning rate on the assets); The risk margin is now account specific; The expected rate of return on the assets has been changed from 6.75% pa for all years to 7.7% for the first year, 7.3% for the next year and 6.75% pa for subsequent years; The funding horizon for the new claim funding adjustment is now zero i.e. the risk margin is funded immediately. Before examining the effects of the latest changes, we note that there have been significant changes to the funding parameters in each of the last 3 years. Insurer solvency standards reducing risk in a risk business Richard Dean Significant earthquakes in Christchurch have brought the need for stability in the New Zealand insurance market into sharp focus. When will the Fund become cash flow negative? DOMESTIC BUILDING INSURANCE PREMIUM VALIDATION REVIEW April 2015 An appropriate citation for this paper is: Essential Services Commission 2015, Domestic Building Insurance: Premium Validation Review, April.